The Chinese Zodiac (Sheng xiao, 生肖) is a scheme that relates each year to an animal and its reputed attributes, according to a 12-year cycle. Chinese Zodiac combining with 10 the Heavenly Stems and 12 Earthly Branches is widely used as a means of numbering days and years, not only in China but also in other East Asian nations like Japan, Korea, and Vietnam. The zodiac traditionally begins with the sign of Rat – 鼠 (子), and the rest are Ox – 牛 (丑), Tiger – 虎 (寅), Hare – 兔 (卯), Dragon – 龙 (辰), Snake – 蛇 (巳), Horse – 马 (午), Ram – 羊 (未), Monkey – 猴 (申), Rooster – 鸡 (酉), Dog – 狗 (戌), Pig – 猪 (亥). Why Chinese Zodiac was in such an order has long been an interesting topic in China since it came into being. Many famous Chinese scholars, even including Zhu Xi and Wang Shou Ren, the two most important Neo-Confucian thinkers since Song Dynasty, brought out their own explanation. 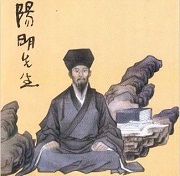 regarded as the most important Neo-Confucian thinker, with interpretations of Confucianism that denied the rationalist dualism of the orthodox philosophy of Zhu Xi. zodiac. According to him, the zodiac animals' sequence was determined based on their toes. Those with odd number toes are said to have Yang quality, and thus should be placed above those with even number toes who are considered to have Yin quality, and every pair of Yin and Yang should be arranged alternately. Please see the following table. Snake: 0 toe, some think zero is a even number, but according to Hong Xun (洪巽), a scholar in Song Dynasty, the tongue of snake has two tips, so it is an animal with even number. a change from even number to odd number, and it coincides with the first time-period of a day, which is 11pm to 1am, symbolizing a transition from night to morning, or Yin (even number) to Yang (odd number). Thus Rat, the smallest animal of the twelve but also the most significant one of all, earned the first place of the zodiac assignment. Identifying this scheme using the term "zodiac" reflects several similarities to the Western zodiac: both have time cycles divided into 12 parts, each labels at least the majority of those parts with names of animals, and each is widely associated with a culture of attributing influence of a person's relationship to the cycle upon their personality and/or events in their life. Nevertheless, there are major differences: the "Chinese" 12-part cycle is divided into years rather than months; contrary to the association with animals implied in the Greek etymology of "zodiac", actually four of the Western "signs" or "houses" are represented by humans (one such sign being the twins "Gemini") and one is the inanimate balance scale "Libra"; the animals of the Chinese zodiac are not associated with constellations, let alone those spanned by the ecliptic plane. Yet another legend is based on the Yin-Yang concept. In Chinese Calendar Science, time is described in 10 the Heavenly Stems (the upper portion) and 12 Earthly Branches (the bottom portion). As the zodiac animals representing the 12 Earthly Branches, their sequence was determined based on their toes (which is the bottom portion of their body). Those with odd number toes are said to have Yang quality, and are placed under the odd numbered sequence. Those with even number or no toes (as zero is an even number) are said to have Yin quality, and are placed under the even numbered sequence. Note that because of a unique feature of rat's toes, he earned the first place of the zodiac assignment. The rat’s front leg has 4 toes and hind leg has 5 toes indicating a change from even number to odd number, and it coincides with the first time-period of a day, which is 11pm to 1am, symbolizing a transition from night to morning, or Yin (even number) to Yang (odd number). Thank very much for your kind comment.